Off-leash exercise is the most relaxing kind of exercise for a dog. Free from restraint, a dog can really be a dog. You can enjoy the beauty and expression of their movements. However, finding a place you can safely and legally do this is difficult. Finding a good place often requires some detective work. Ask other dog owners where they exercise their dogs. A farmer might give you permission to use his fields when the crops aren't growing. If you have a friend who is a realtor, he may be able to tell you where there is vacant land for sale that you can use until it is sold. Trails where you and your dog can walk together are good for off-leash exercise. Keeping your dog with you when he is off leash is easier if you are going somewhere, not just standing still. Walking also encourages your dog to exercise more. People who like to hike may also be able to give you some tips, as may books on local hiking trails. Look for side trails off the more popular trails where you can avoid bothering other people. Buy a topographic map and peruse it for old logging trails. Check out state game lands and snowmobile trails. Ask hunters, especially those who hunt with dogs, for suggestions. Be careful if you are using areas where people hunt; know when the various hunting seasons start and end so you can avoid being out during those times. 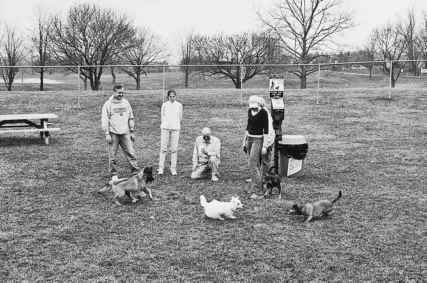 Dog parks are a great way to exercise and socialize your dog. be able to do so only if you are very careful to avoid infringing on the rights of other park users. Any time you have your dog off leash, it is of paramount importance that you respect the rights of non-dog owners. Previous failure to do so on the part of many dog owners has resulted in greater and greater restrictions on the places our dogs can go. Your dog has to be very responsive to your commands, never wandering far from you and always coming when called. In a park, other people and dogs present a strong distraction that makes control of your dog difficult. Visiting a park during off hours, either early in the morning or at dusk, is a good idea. Popular additions to parks now are dog parks, which are fenced areas set aside for use of dog owners. And popular they are! A dog park that recently opened in my area was swamped with people, some of whom drove a long distance. Dogs parks can be private or public. There is sometimes an entrance fee. Please read the section below on dog play groups for information on dogs interacting. A dog park works best when there is a separate area for small dogs. Interactions at dog parks can build confidence and be great socialization, but be careful that your dog isn't bullied. If your dog is frightened, he may become aggressive. If there are no good places in your area to allow your dog to run off leash, try to get your local government to open a dog park. It's a great way to keep the peace between dog and non-dog people. You must also respect the rights of dog owners who keep their dogs on leash and may not want other dogs near them. As the owner of a dog who is sometimes aggressive with other dogs, I know it is infuriating to have to lift Sabre off his front feet by means of his collar and let him strangle while another dog who is off leash runs around him, ignoring his owner's commands to come and eluding all attempts at capture. Hopefully, it is not necessary to remind you that you must clean up after your dog. My favorite cleanup method is a plastic bag pulled over my hand like a glove. Once the stool is picked up, I pull the plastic bag back over my hand and knot it. These bags are convenient to carry in your pocket. Use a part of the park that is least used, away from eating areas and places where children play. Don't ruin a privilege for everyone; clean up after your dog. Keep in mind that even if you clean up after your dog, there is some residue left in the grass that picnickers shouldn't have to sit in or children play in. If you are going to exercise your dog off leash, there is always a risk that he will become separated from you and lost, so good identification is necessary. The best form of identification is a tattoo, which was described in the previous chapter. Even if your dog is not exercised off leash, a tattoo is still a good idea. It is insurance against your dog being stolen. Dog theft is a multimillion-dollar business in this country. Stolen dogs are sold to dealers, who in turn sell them to laboratories. 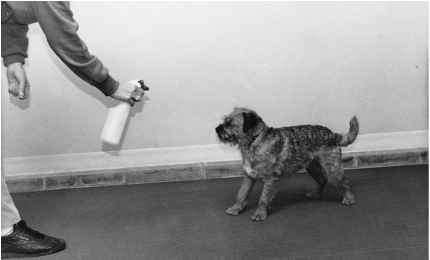 Since laboratories do not buy tattooed dogs, such dogs aren't stolen; if they are, they are turned loose. Tattooing is not expensive, and is the best insurance that, if you ever lose your dog, he will be returned. Even if it means driving a half hour to get there, or spending a lot of time training your dog to come when called, you and your dog will both be happier if he can get some off-leash exercise.